Pastries, breads, muffins, cupcakes, truffles, chocolates, wedding cakes and many other sweet desserts have become a common part of celebration and events. Do you wish to start your career in this wonderful culinary field where you will learn and prepare different varieties of bakery products? If answer to your question is yes then Pastry Colleges and Baking Schools Program might help you reach your goal. Baking and Pastry arts study prepare students for a bright career in the food service industry. One can learn different techniques for preparing cake, bread making and all the basic fundamentals of kitchen management. Good stamina, attention to details, artistic skills, creativity, and proper customer service are some of the skills required in every pastry chef or any culinary professional. Best cooking schools, pastry chef schools and colleges, culinary universities and art academics offer different choices to kick start your career in baking and pastry field. A lot of baking and pastry chefs further move to take certification in their artistic skill. It is not mandatory for any kind of Certification but for gaining more knowledge bakers and pastry chefs prefer to take it and become helpful to add more professionalism to your chef profile. Culinary Graduates prefer getting certified through the American Culinary Federation (ACF) and the Retail Bakers of America institute. Exams conducted by the institute are supposed to be cleared for obtaining the desired certificate and also eligibility criteria must be fulfilled before appearing for the test. ACF offers different certification grades such as CPC (Certified Pastry Culinarian), CWPC (Certified Working Pastry Chef) and many more. Applicants must complete high school or at least 100 hours of continued education credit to be eligible for the exam. The retail bakers of America provide four various levels of certification focusing on the expertise in areas like baking, management, sanitation and retail sales as well as staff member training. Certified Journey Baker: It suits a baker who assists in preparing bakery items for a commercial bakery. 1 year of experience of working in a bakery is mandatory to be eligible for the test. Certified Baker: Prepares baked products while helping general bakery operations. 4 years of work experience in bakery is required. Certified Decorator: Prepares and decorates sweet baked products for the commercial bakeries. 4-year of decorating work experience in commercial/retail bakery. Certified Master Baker: Individuals should possess technical and a very good administrative talent as it is required for managing and operating the production region, including different varieties of activities for an individual in-store mercantile bakery. Minimum 8 years of baking experience from a bakery is needed. As per the estimated report by BLS, remuneration for every culinary expert varies depending on the role performed by him/her. Professional pastry chef and speculator’s salaries will vary due to various factors like demand; education; geographic location as well as experience in bakery or relevant sector. Handle and organize the kitchen and staff appropriately. Decorate several pastries, desserts and cakes. Bakers produce different types of breads in varied quantity and quality. They check the quality of mixture used for preparing various foods. They work for hours to prepare, measure, weigh the flour to make dough used for baking. They apply icings, glazes and other toppings using brush or spatula. Baking & Pastry chef prepares various types of breads, chocolates, muffins, pastries, fruit pie and different sweet desserts. Accurate use of Microwave oven with great artistic talent in preparing various baked products is the sweetest talent earned in this occupation. Pastry chef schools and colleges as well as baking schools provide ample number of degree programs in culinary arts and hospitality field and thus students may choose to earn a bachelor's degree in baking and pastry arts, associate of applied science in baking and pastry or a diploma/certificate in baking and pastry arts. Provided by: Top cooking schools such as art institute, baking and pastry colleges and universities. Requirement: Bachelor's or Associate's degree with relevant work experience in culinary field. Best suited for: Earning a title such as Executive Pastry chef, Culinary Instructor or any high authority entrepreneur position. Successful graduates can start their own restaurants, hotels or can take up any cake shop business. Given by: Baking and pastry chef schools, 4 - year culinary and cooking colleges, universities. Ideal for: Entry level position into the restaurants, resorts, hotels. Successful degree holders may work in the casinos, catering firm, restaurants, hotels, large bakeries or even can own a bakery or restaurant. Offered by: Cooking and pastry chef schools, 2 to 4 year colleges and universities, community colleges, vocational and career schools. Best suited for: Moving in an entry level position into the restaurants, resorts, hotels and baking organizations. 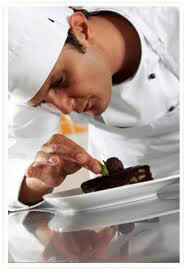 Common Job designations that can be earned are Chocolatier, Pastry cook, Baker, Assistant Pastry Chef. Offered by: Baking and Pastry chef schools, colleges. Match for: Professions such as Assistant Bakers and Pastry Chef, Lead and Head Bakers, Wedding Cake Decorators. A successful graduate may obtain thorough training in preparation of pastries, breads, cookies, pies, fruit bars, tortes, wedding cakes and many other international desserts. As per a report estimated by BLS, employment growth in baking and pastry career and overall culinary field is likely to be positive in the upcoming years. Baking and Pastry chef being a subfield of culinary arts may expect a fair employment development. Personnel seeking the path in baking and pastry field may also have a desire to develop their career in culinary science, food preparation, culinary arts and professional cooking.